The event was attended by Deputy Prime Minister and Foreign Minister Pham Binh Minh, who was on an official visit to Singapore from July 30-31, and Singaporean Minister for Culture, Community and Youth Grace Fu, along with hundreds of guests. In his opening remarks, Deputy Prime Minister and Foreign Minister Pham Binh Minh said over the past 45 years, the Vietnam-Singapore relationship has continuously moved forward with marked progresses made in cooperation in various areas, ranging from politics to economy, trade, investment, national defence and security, education-training, and tourism. Singapore is one of the first ASEAN nations with which Vietnam has set up the Strategic Partnership, he said, noting that the two countries have shared similar viewpoints and strategic visions on many major issues such as the regional structure, ASEAN’s central role, and the advocacy of multilateralism and the rule of law in a changing world. Successes in bilateral economic, trade and investment collaboration have made Vietnam and Singapore indispensable partners of each other, the diplomat said. Singapore is the leading ASEAN trade partner and the eighth largest trade partner globally of Vietnam, he said, adding that Singapore’s projects have played a key role in Vietnam’s regional economic transformation. Minh highlighted the nine Vietnam-Singapore Industrial Parks (VSIP) in Vietnam as a symbol of the bilateral economic and investment ties. He affirmed that for each Vietnamese, Singapore is a great and faithful friend. Cultural similarities have brought the two countries closer and served as a firm pillar for the relationship. Echoing Minh’s views, Singaporean Minister for Culture, Community and Youth Grace Fu praised the growing bilateral partnership, affirming that cultural cooperation and people-to-people exchange is a spotlight of the bilateral ties. Vietnam and Singapore will step up cultural collaboration and exchange between their people in order to enhance mutual understanding and trust, thus contributing to consolidating and deepening the Strategic Partnership, she said. 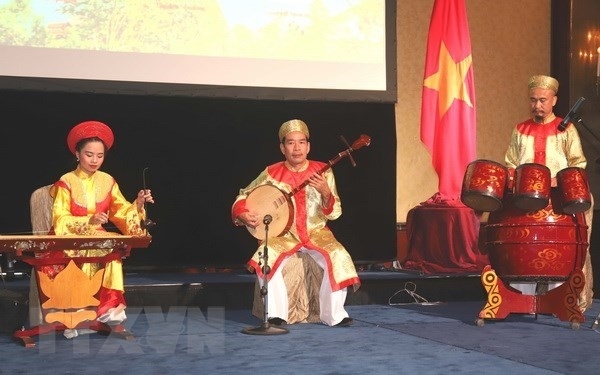 The Vietnamese cultural day featured impressive art performances and paintings by Vietnamese and Singaporean artists along with Vietnamese cuisine. A highlight of the event was a drama directed by Singaporean director Chua Soo Pong and performed by Vietnamese and Singaporean artists.